This land was given to Israel by God for a perpetual possession. It belongs to Israel, not to Arabs. The original image of the above map can be found here. This map shows how God divided the land of Israel among the 12 tribes in Joshua chapters 18-19. Note that God gave Israel both the east and west banks of the Jordan river. The country of Jordan should not exit. 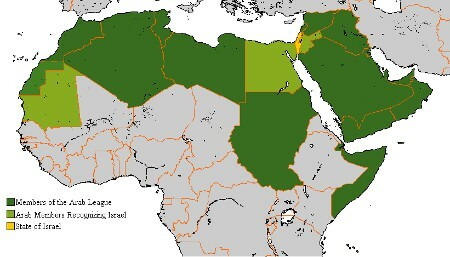 Israel (dark yellow) is extremely tiny compared to the Arab nations (green). There is barely enough land for the Israelis to have a place to live. Israel occupied by violent Arab terrorists. Violent Arabs occupying Gaza, the West Bank, and Jordan take up far more than half of Israeli land, causing a very serious security problem. In fact, it is more than a threat. There is not one area in Israel that is safe. Virtually every day Israelis are murdered by these occupiers. Considering that God gave the land to Israel, why are Arabs occupying the Gaza Strip, the West Bank, and Jordan? Considering that Arabs have already stolen over half of Israel’s land, why should Israel give them even an inch more? 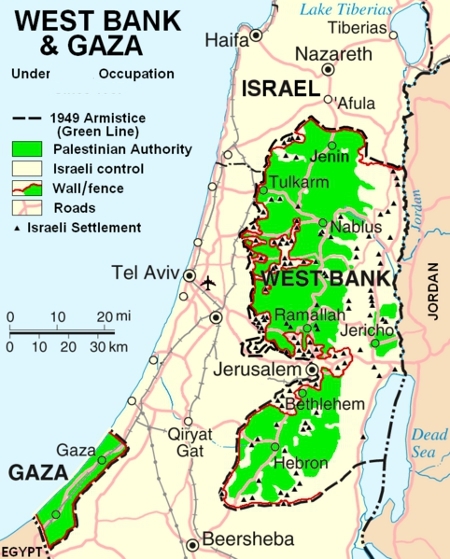 Considering that the Arab nations possess huge areas of empty land, why don’t they gives some of it to the Arabs in Gaza and the West Bank so they can move off of stolen land, if in fact they really care anything about them? Considering that the Arab occupiers continue to use these areas to launch missiles and send terrorists to murder Israelis, why doesn’t Israel evict them? Neither trust in nor fear the US or UN. Just obey God, and all will go well for you. Remember well what the prophet Isaac said to Israel (not to you): “cursed be every one that curseth thee, and blessed be he that blesseth thee” (Gen. 27:29). God is on Israel’s side. If you are wise you will be also. The BBC reports that “Attacks on Israelis ‘fell sharply’ in 2009” — ONLY 566 rockets were fired from Gaza into Israel last year, 160 of them since the Israeli military offensive to stop the rocket attacks last January! Yet Israel continues to be considered the villain, and is demanded to give up more land. What would be happening to Mexico right now had she fired 566 rockets at the USA? Would the world demand that the US give Texas to Mexico to appease them? Let not the nations of the world be hypocrites! 1 Comment to "OCCUPATION: Gaza and the West Bank"